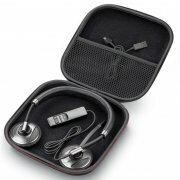 Plantronics Blackwire C720 headsets connect to your PC and Bluetooth cell phone – combining the comfort and durability of corded with the freedom and flexibility of wireless. Experience unprecedented productivity with professional audio quality, call controls at your fingertips and intuitive call management with Smart Sensor technology – answer a call by simply putting on the headset, or pause mobile device media playback by taking it off. 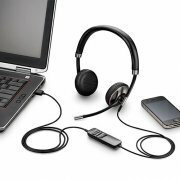 Easily take mobile calls in the office or on the road with the detachable cable, up to 10 hours of talk time, ear cushions that fold flat and a durable, portable carrying case – making it the most productive and versatile "corded" headset on the market. * Monaural wearing style — lets you hear the conversation and what's going on around you. * Works with leading UC softphones — from Ayaya®, Cisco®, IBM®, Skype® and more. * Smart Sensor technology — lets you answer a call simply by putting on the headset. * Smart call transfer — automatically routes audio from the mobile phone to the headset whenever it's put on – and vice versa. * Unmatched sound clarity — with noise canceling microphone and wideband audio. * Inline indicator lights — and user friendly audio alerts the user to connection, mute and volume status. * Dynamic EQ feature — automatically adjusts audio settings between voice calls and music. * Enhanced Digital Signal Processing (DSP) — provides more natural voice sound. * SoundGuard® technology — provides protection against audio spikes.